Verified on 23 Apr 2019. Have you heard Amazon is Offering discounts on Electronics this season? Since Amazon is one of the largest online marketplaces throughout the world, there is little doubt over how they have become the most popular shopping portal in India. Besides their great variety of products, they are also known for being one of the best shopping sites, offering great deals and hosting exciting sales from time to time. 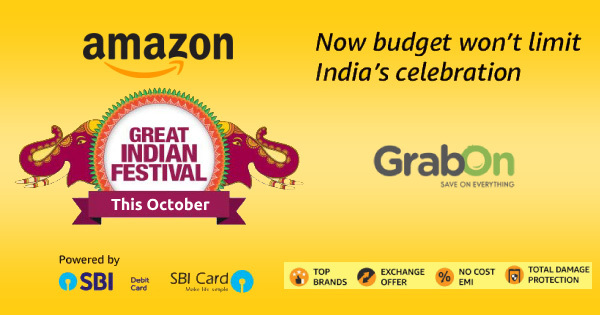 This time, Amazon is again back with their Great Indian Festival 2019, where you can get almost anything at unbelievable discounts. The latest Amazon Great Indian Festival will be on soon. It is going to kick start from the 2nd of November 2019and will be running until the 5th of November 2019. The Amazon Great Indian Festival is going to win hearts again, with all the exclusive deals and discounts. And this time, it is going to be bigger and greater - big savings on big brands. So, if you always have had that brand fixation, this is the time to shop till you drop, without having to think about the budget. It will not skyrocket as you can have everything on discount, be it electronics, apparel, electronics or home and kitchen products. If you don’t have the Amazon app, download it today! Load money into your Amazon Pay account or create and load money if you don’t have one yet. Now, you are ready to start shopping! Stay tuned and shop more at Amazon. The bigger the brand, the better will be the deal in this Amazon Great Indian sale. Yes, this is the time to root for your favorite brands. A Puma lover or an Adidas freak? Get minimum 50% off on Puma and up to 40% off on Adidas this sale. Besides these, you can enjoy up to 60% off on Amazon basics, up to 50% off on Prestige, up to 40% off on United Colors of Benetton, up to 30% off on Levis, up to 20% off on LG, exchange offers and more on OnePlus phones and much more exclusive offers and deals. Amazon, a brand that has come to be synonymous with online shopping is also known for hosting big sales every year. This time too they are going to run the Amazon Great Indian Sale from the the 10th of October to the 15th of October, 2019. And this time you will get bigger deals on bigger brands such as American Tourister, Motorola, Bosch, Dell, Puma, KENT, Sony and much more. There will also be up to 50% off on mobile and accessories, 40 to 80% off on fashion and various other such offers. Start planning what you would like to buy from now on so that you miss out on none of the deals. There will be new deals in every 30 minutes other than Midnight and Blockbuster deals. Join Amazon Prime and top up Amazon Pay account to make shopping during the sales easier than ever. Enjoy shopping at the Amazon Great India Sale.